RETHINKING LAW: LOSS OF IGNORANCE OR INNOCENCE? The Faculty of Law, University of Colombo, Sri Lanka proudly celebrates its 70th Anniversary this year. The Faculty has been the cradle of many renowned legal luminaries who served their mother country holding very high and prestigious positions. It takes pride in producing the first woman Chief Justice of the country, judges of the highest court of the land, eminent scholars and practitioners recognized by world-class universities around the globe, and leading politicians in the country including the current Prime Minister. To mark the 70th Anniversary, a series of events of academic and extra- curricular activities has been organized by the Faculty. 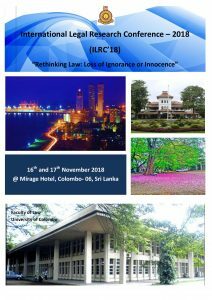 As the pinnacle of such many events, the Faculty will be holding an International Legal Research Conference on the 16th and 17th November 2018 with the participation of a good number of foreign and local scholars. Being the first of its kind in the history of the Faculty, the two day Conference would attract many participants from various countries. It would be a golden opportunity for legal academics, judges, practitioners from official and private bar, and law students and others interested to participate and get themselves attuned to the developments in law taking place and become accustomed to the directions in which such developments would lead us in the near future. Copyright © 2018 Faculty of Law, University of Colombo.